In my sailor grandfather’s footsteps I have blagged my way into an oil refinery and onto a Shell tanker, I’ve crossed the Atlantic by container freighter and dropped a wreath into the night black sea at 49° 35’N, 19° 13’W where he and his final crew were lost – I have even traced and befriended the last old man of the U-boot crew that killed him. For nearly 20 years I have read letters and diaries, rooted through archives, pored over photographs and asked damn fool questions of elderly seafarers who have shared their yarns with gentle amusement. But I remained an armchair sailor, sitting in the warmth, reading about a life beyond my understanding. 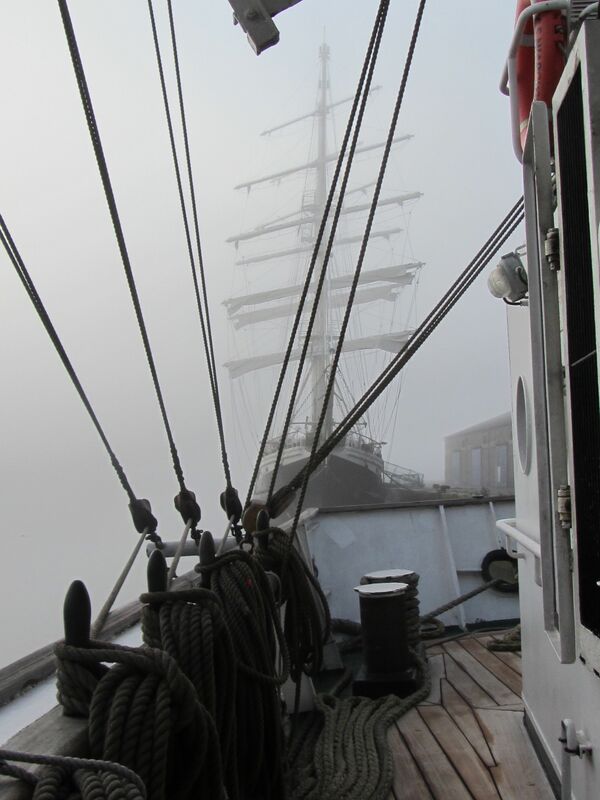 It was on a wet day in Liverpool docks that I ran into the Stavros S Niarchos, a dinky, modern sail training brig – square rigged on two masts, a charity venture providing outdoor challenges to young people. And also, it transpired, to the not so young. Anyone up to 80 could have a go, said a grey-haired woman on the quayside. Was I too old to climb out along the yards, I asked – to try to experience what 16-year-old Bertie Sivell had seen and felt when he first went aloft a hundred years ago? Certainly not, she said, she had. The author – climbing past the fore t’gallant (right) to the royal beyond, where photographer is perched (see boot). Anyone who ever read Treasure Island under the bedclothes and fell asleep dreaming of clambering among the spars of a tall ship will understand (and we who read by torchlight in the old days before duvets and Kindles know who we are). To swing up the swaying ratlines and out along the foot-ropes, and see “my” ship splice the waves 120ft below; to roll along a pitching deck, at one with the swell, dodging sheets of spray; and to lie down each night tired but buzzing and be rocked to deepest sleep? Stavros is not Monkbarns. 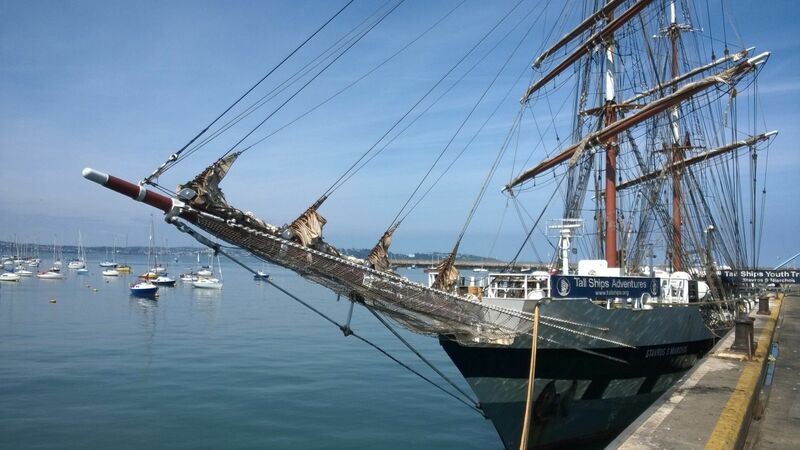 For a start she is smaller, with two masts not three and fewer yards and sails. She also has two engines, GPS, refrigeration – and heat and light and hot showers and plenty of fresh water and good food. In fact, my grandfather would scoff that my so-called experience in sail bears more resemblance to glamping than the conditions he endured when he began his career at sea as an apprentice in Monkbarns in 1911. What a difference 100 years makes. The barrels of pork and beef gristle in brine are gone. The yawning cargo hatches and mountains of coal or guano, or slimy stone ballast, that had to be winched in or out basket by basket are gone. Nowadays safety lines snake up the ratlines and along the yards, where there was once only a boy’s own grip. The old cry of “One hand for the ship and one for yourself,” is not quite so scary when you’re wearing a stout harness and clip-on carabiners. Monkbarns suffered countless injuries, as well as losing two young lives overboard in just three years in the early 1920s – Laurence O’Keeffe off the jib-boom and apprentice Cyril Sibun in a fall from the fore upper t’gallant. They were 18 and 19. 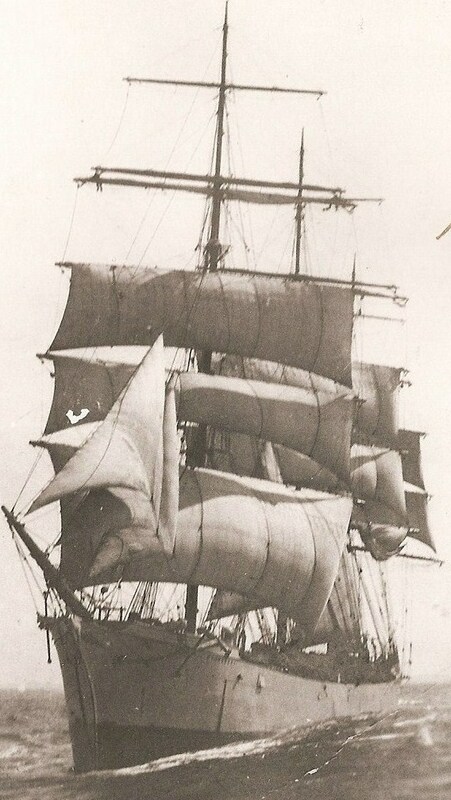 Author (centre) on lower topsail carrying out a harbour stow in half a gale. 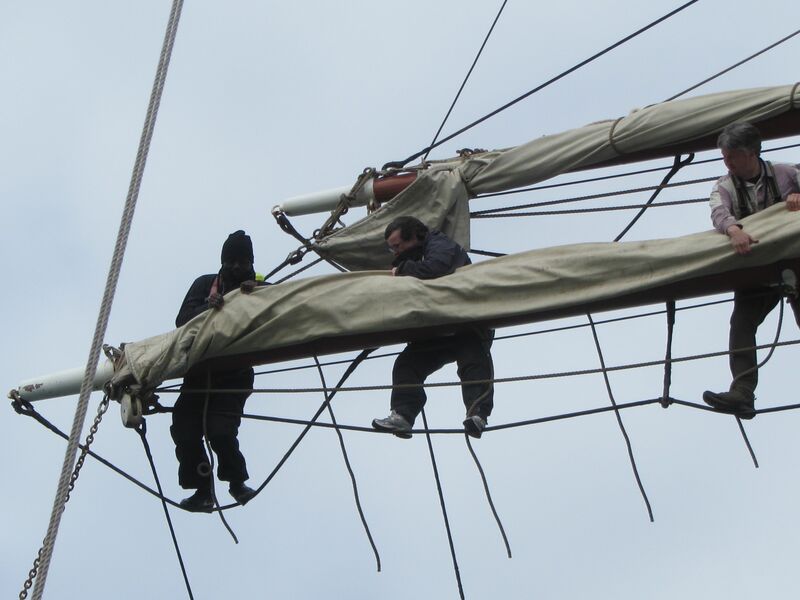 On Stavros clean, dry pipe cots with reading lights and lockers fill the t’ween decks where Monkbarns’ apprentices would have shovelled and sweated to trim (balance) the cargo, and out along her bowsprit net “sailor strainers” prevent accidents. 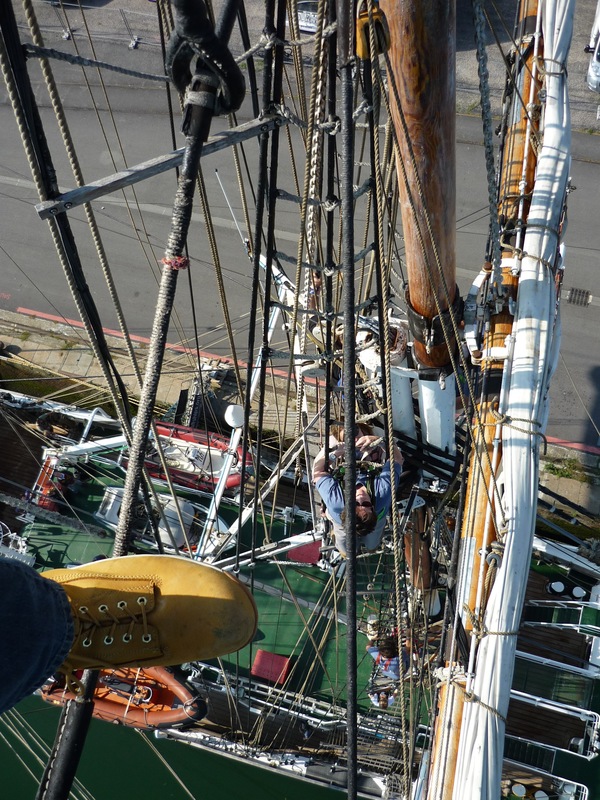 But working a sailing ship is still not for the faint hearted. I have shuffled out along the yards, muscles cracking as I wrestled to haul up and lash down the heavy clew of the sail high out over the waves. I have swung one-armed under the great steel yards, groping for gaskets blowing in the wind, and tied knots one-handed up and down the jackstays. Together we have seen sails silhouetted against the stars – more stars than most of us city dwellers ever imagined, and the milky way arching overhead from horizon to horizon. We have sailed into the sunset and watched for dawn, eyes peeled for the pin prick lights of the fishing fleet. We have learned the ropes, and the buoys and the markers. 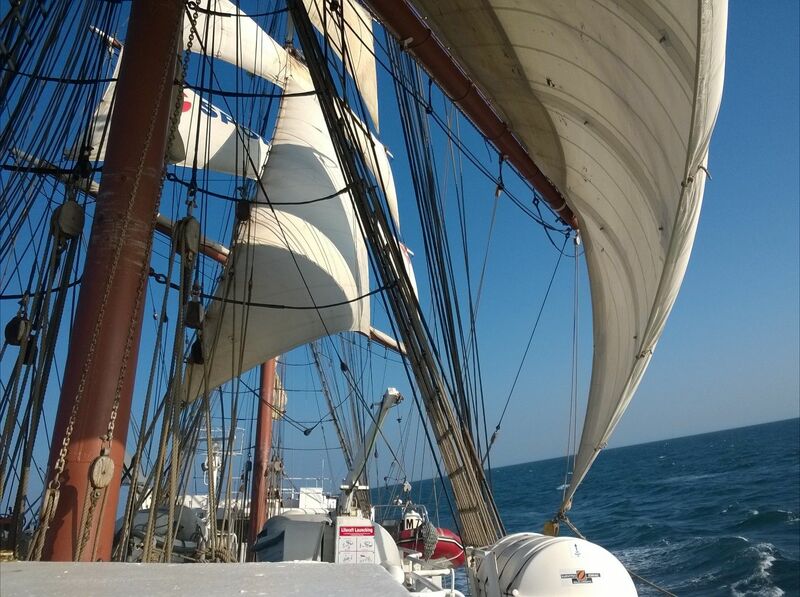 So far I have not been out of sight of land for more than a week, much less braved day after relentless day of gale-force winds, or icebergs round the Horn, but I have felt the pitch and roll of a tall ship doing 10 knots under sail and watched the horizon tilt and tip under the solid curl of the mainsail. I know the sound of the seas crashing past the scuppers and have tasted salt in the spray. I may be just paddling in the shallows of my sailor grandfather’s life, but I have sniffed Stockholm tar. Suddenly, the dusty records have colour and movement. This winter I shall abandon the archives again and join the paint gang aboard Stavros in Liverpool docks, chipping and cleaning, learning “my” ship from the rivets up, and next spring with a crisp CRB certificate in my pocket I hope to sail as volunteer crew – as cook’s assistant, if that’s what the ship needs. Somewhere, my grandfather is laughing. Previously – Monkbarns: Britain’s last Cape Horner?